The week I spent in South Africa’s most famous attraction, Kruger National Park, was incredible. But it was also very intensive. I rented a little Fiat 500 and spent every day scouring the park. Not only did I cover the popular areas in the south of Kruger National Park, but I also covered almost the entire north. I was up at 5:30am each morning to be out when the gates opened, and other than a lunch break, I was out until the sun was down again. I was intent on getting my money’s worth, and I did. Of course, finding my leopard was the biggest victory on the trip. 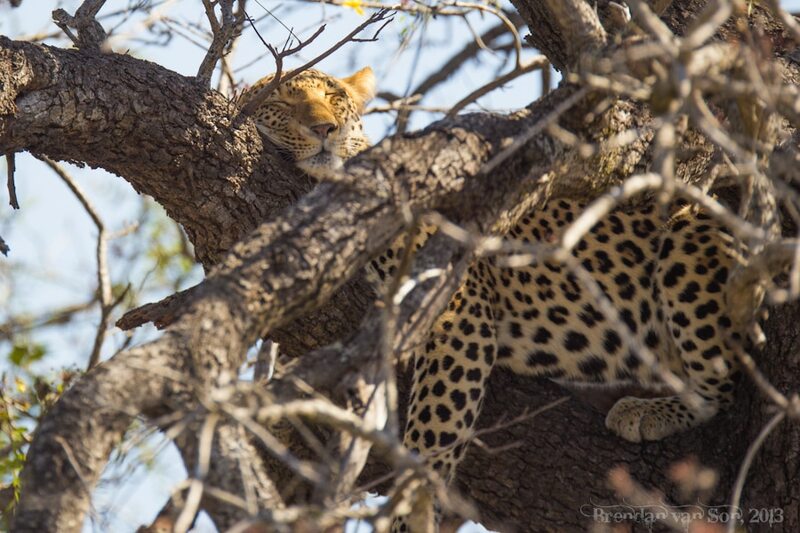 But my sightings in Kruger National Park were extensive, and I think the thing that as most impressive about Kruger was the vast diversity of landscapes, habitats and sightings. I saw everything from cheetah to guinea fowl and everything else in between. I spotted lions hunting, elephants charging tourists, and even some elusive birds like the southern collard ground hornbills. Anyways, I’ve selected the favourite photo of my favourite animals throughout Kruger National Park. There is also a caption explaining what your seeing and how many of that species I saw in Kruger. 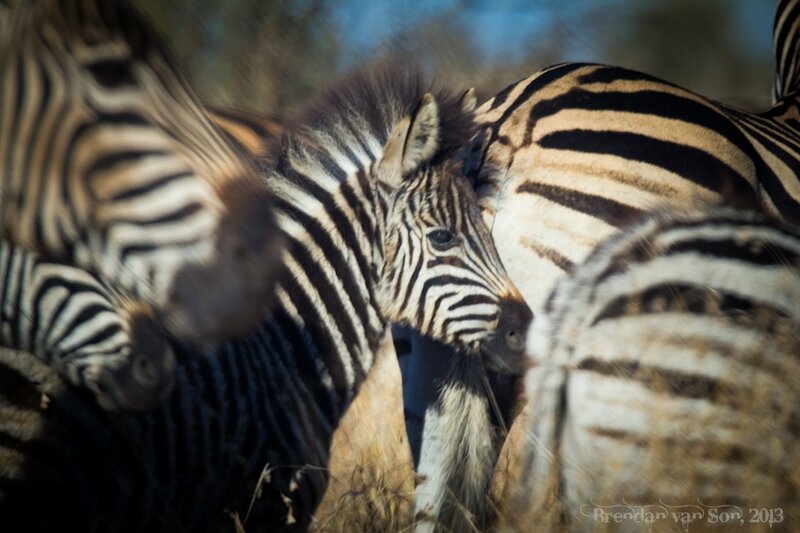 Also, if you enjoy the photos, be sure to check out my tips on how to take great safari photos. I hope you enjoy the images! I really with this image was sharper. I was fiddling with the Sigma 120-300mm lens I had and still wasn’t comfortable with the lens. I ended up manual focusing all the images you’ll see here because of it. This was an awesome scene, but gone before I got a chance to properly photograph it. I only with wildlife would stay still a bit more. Fact: Wildebeest are pretty ugly. They are also probably the least photogenic of all animals since they just constantly graze. I got a photo of this Wildebeest grazing, I didn’t get much better. 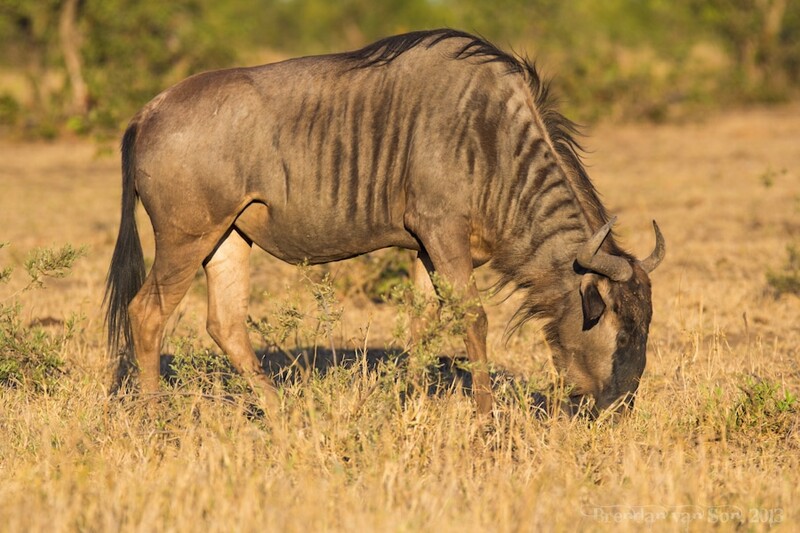 Wildebeest sightings in Kruger are a dime a dozen. 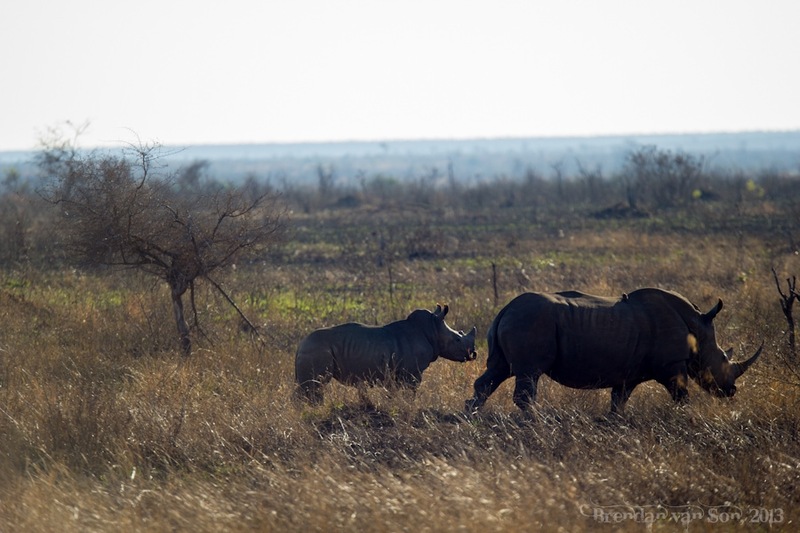 I saw lots of Rhinos in Kruger, 11 in total. Some of them were only a couple feet away. However, I love this photo because of the baby. They might have been a long way away and the light is terrible, but a baby rhino! How awesome is that. It looks like a robot! When humans go through puberty we look terrible, when lions do, they look pretty badass. This young male lion had just gone on an unsuccessful hunt with two female lions and was nice enough to pose for me for a bit. 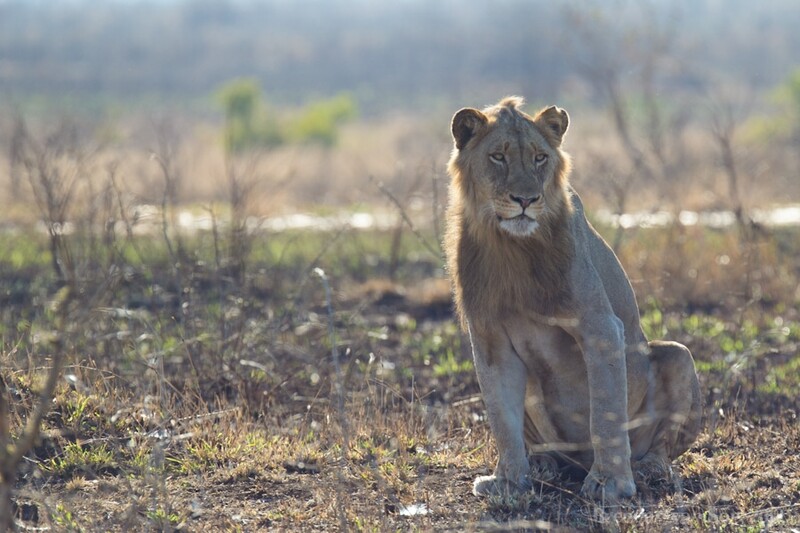 This was one of 5 lions I saw in Kruger National Park. Oh the leopard. This was the second of two leopards I saw in Kruger, and while I like my photo of the other one better, well, you’ve seen it already. This one was right next to the road, but there was a massive car jam so I took two photos and then bailed quickly. Probably my second favourite of the antelope, this is a kudu. 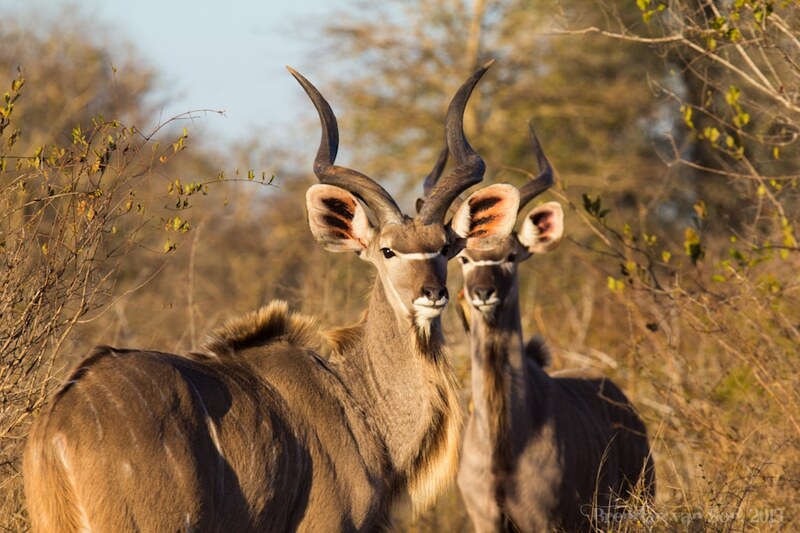 You see loads of kudu in Kruger National Park, and if you’re lucky you might get close to some nice bulls like these guys. 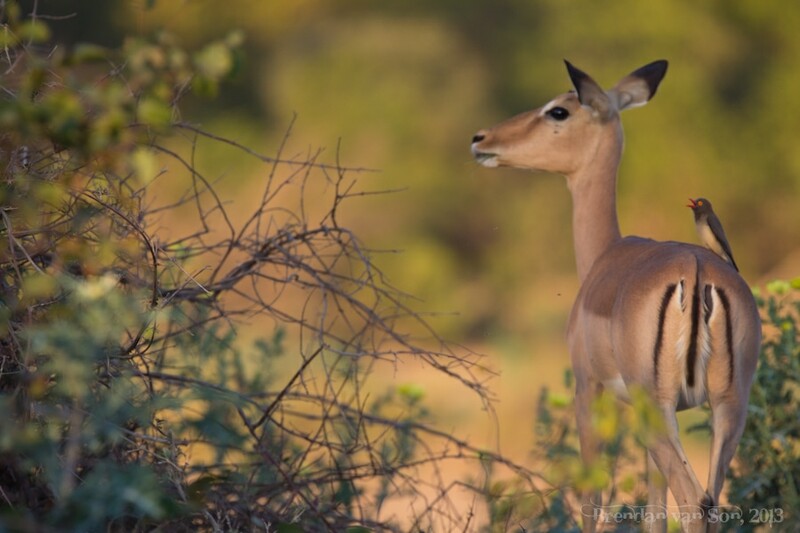 This is a female impala. Trust me when I tell you to photograph one. You’ll see so many you’ll always think “well, I’ll see more.” I only have a couple impala photos and I kind of regret it. 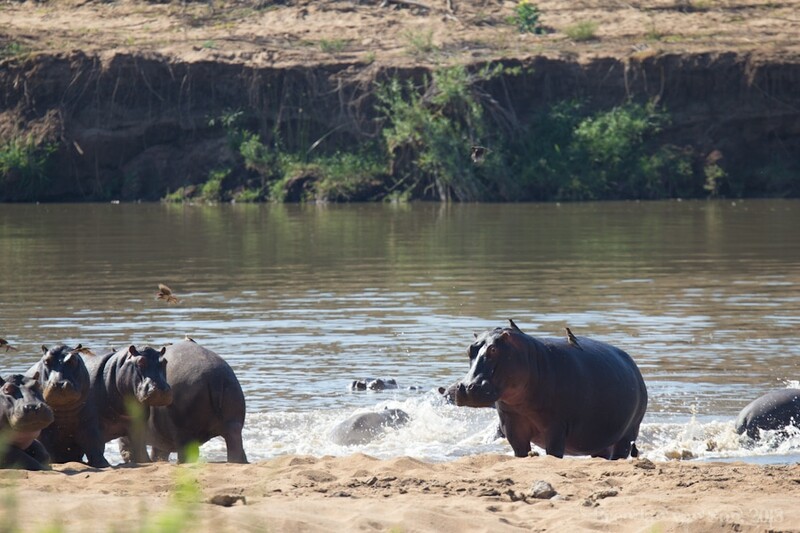 The 4th member of the big 5 on this Kruger sightings list, these are some hippos. There are actually far more hippos in Kruger than I expected, but as usual, they are lazy slobs who just hide out in the water all day. #WaronHippos! 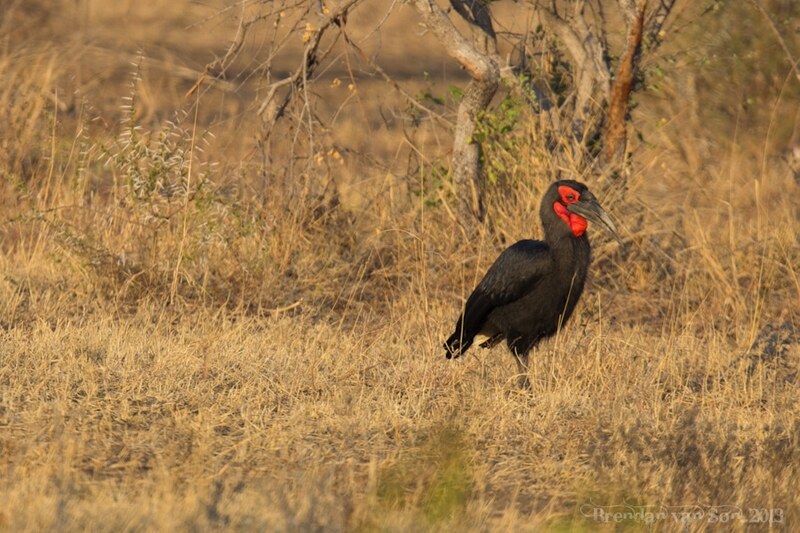 It might just look like a bird, but a ground hornbill in Kruger is as rare as a leopard. I spotted this guy and two others along the highway in the north of the park one day. 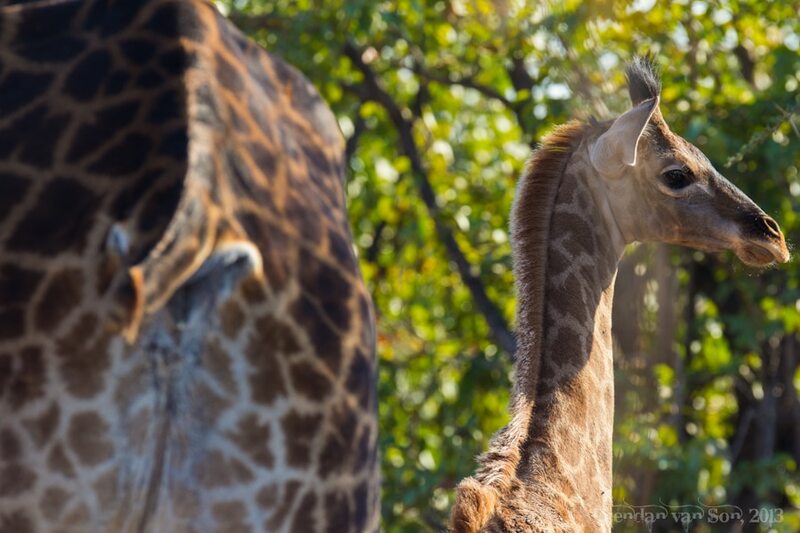 This was easily the youngest giraffe I found in Kruger. This little dude was barely able to walk. The awwwwww factor though, was through the roof. I saw loads of elephants in Kruger, and was even charged at one point. This lumbering giant was alone and out for a morning stroll. It’s fairly rare to spot elephants at dawn, they tend to come out in the afternoon, so the light in this photo is much better than all my other elephant shots. Another one of those images that’s not so close, but cool because there’s young ones. This is a cheetah with three young ones. They spotted something in the distance and actually for about 30 minutes the mom went off and the little guys stayed back and waited. 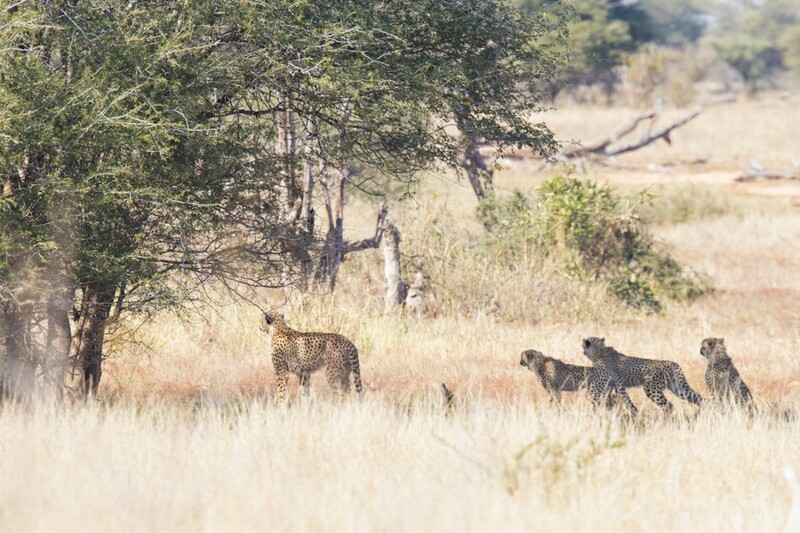 Not sure caught the mother’s attention, but seeing a bunch of cheetahs like this was a dream come true. 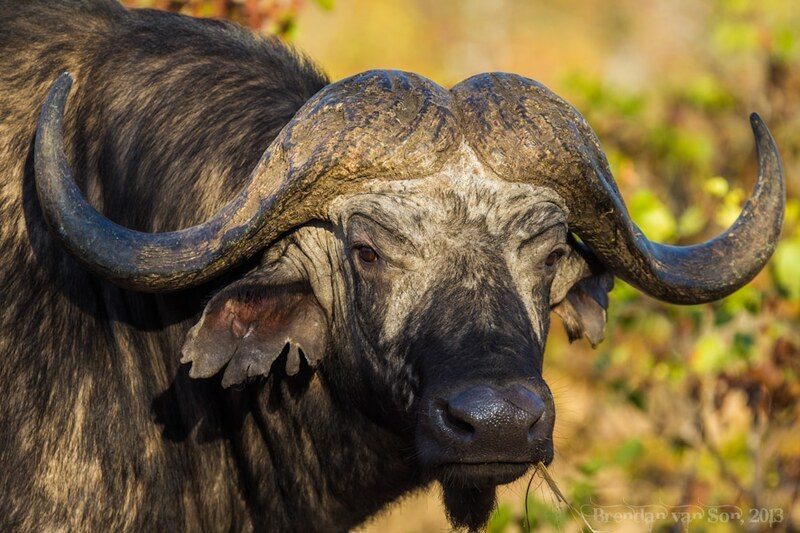 To complete the big 5, this is a profile of a water buffalo. I don’t think buffalo get enough credit for being scary as hell. Their eyes are sheer terror. But that being said, I’m not really sure how they are a member of the big 5? They really are just angry cows. 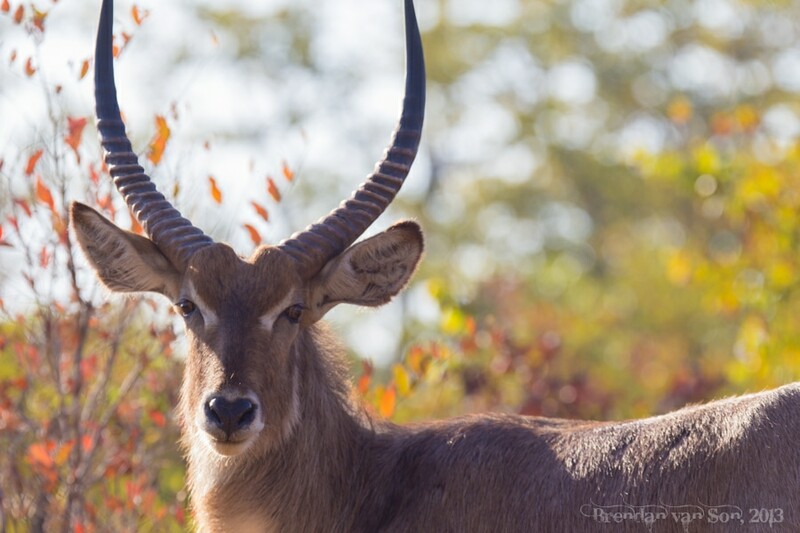 When I came across this waterbuck amidst some fall colours my first thought was “that dude is majestic as f**k. The light was perfect, and though I struggled with my lens a bit (I was too close if you can believe it), I ended up getting a couple cool shots. Next ArticleGoing on Safari in South Africa? Rent a Lens! When the wildebeest run they are amazing. And the buffalo is the meanest SOB of the 5. Kruger is an awesome wildlife park. Can hardly wait to return. 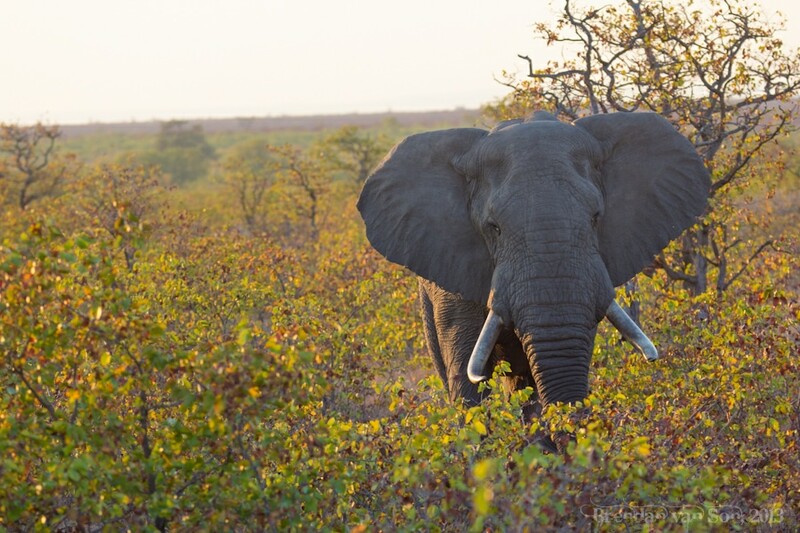 What is your opinion of Kruger versus Etosha in Namibia? Also, what did you pay for your little rental car, and from where? I missed out on a leopard, but enjoyed the heck out of Kruger. I have a tough time deciding if I like Kruger more than the Masia Mara, and Etosha. They are all great. By myself. Easy to do a self-drive in Kruger. I’d recommend going with someone though so you have 4 eyes spotting wildlife! Awesome pictures dude. If you dont mind telling me, what camera do you use? I shoot a Canon 60D. I shot most of these on a Sigma 120-300mm f/2.8 lens I rented in JoBurg. You’ve done a great job! The safari photo tips are great too! I like te ground hornbill and you choice for the fiat 500! I love these pics they are so awesome.I WOULDE LOVE 2 GO WID U BRENDAN .